This Brilliant Sign Against Bullying Should Be Up At All Schools. 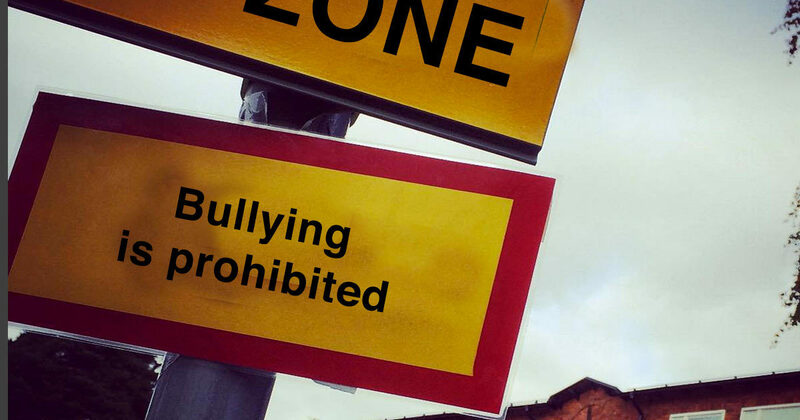 Newsner » News » This Brilliant Sign Against Bullying Should Be Up At All Schools. Bullying is just not excusable. It can really negatively affect a child’s self-esteem. When I think of how useless and hurtful it is, I just wish it would cease to exist everywhere. I recently came across this story of a dad who took matters into his own hands at a local school near Stockholm, Sweden. What he did is so simple, I kept wondering “now why hasn’t anyone thought of THAT before?” He erected a street sign right by his neighborhood’s school stating a simple, clear rule: “Bullying is prohibited.” The father, Pelle Wittheden, says he wants all schools to take bullying very seriously. “Everyone has to take responsibility to stop bullying” he writes on Instagram, where he published the photo of his makeshift street sign. Genius idea, Pelle. I really think this sign should stand outside schools everywhere. Here is the original sign that Pelle erected just below the official “school zone” sign. “I put up this billboard at school today. Everyone has to take responsibility to stop bullying,” he writes below his picture. We recently reported how another father also took matters into his hands and did this after learning that his daughter was being bullied at school. Serious kudos to these dads and others like them working towards eradicating this unacceptable behavior from schools! Newsner stands firmly against all forms of bullying and harassment. Please like and share this dad’s brilliant sign if you do too.